Ever start driving down the highway, music blasting, windows down and next thing you know you look down and you are going 15 to 20 over the speed limit? Don't worry, you aren't the only one, sometimes it is to easy to get in the zone, and want to just go without checking the speedometer, but gone are those days. 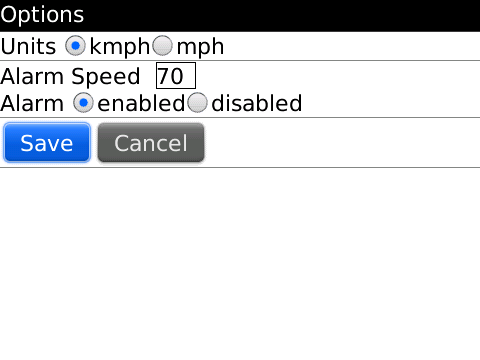 Speed Limit Alarm is a great app for any BlackBerry lover who spends a lot of time in the car, and the concept behind it is quite simple. The application contains a built in analog speedometer which users can set the speed of the designated roads (prior to begining your journey to keep it safe) and if your vehicle reaches this speed and exceeds it the device will beep alerting the driver they have exceeded the limit. For 99 cents this is a great safety application that should be installed on every BlackBerry to ensure that while on the roads you are alert and aware of your speed easily.